For those of you reading this near Mississauga, ON, Premium Retail Group always has great prices at their warehouse sales, at least 60-90% off retail for all your casual clothing: denim, jackets, tops,hoodies, dresses, outerwear, footwear and handbags. There will be over 70,000 units of new inventory and the sale is only while quantities last, so get there early. At this 5-day sale, expect brands you know for women, men and children: Marchiano, Guess, ONLY and Vero Moda. 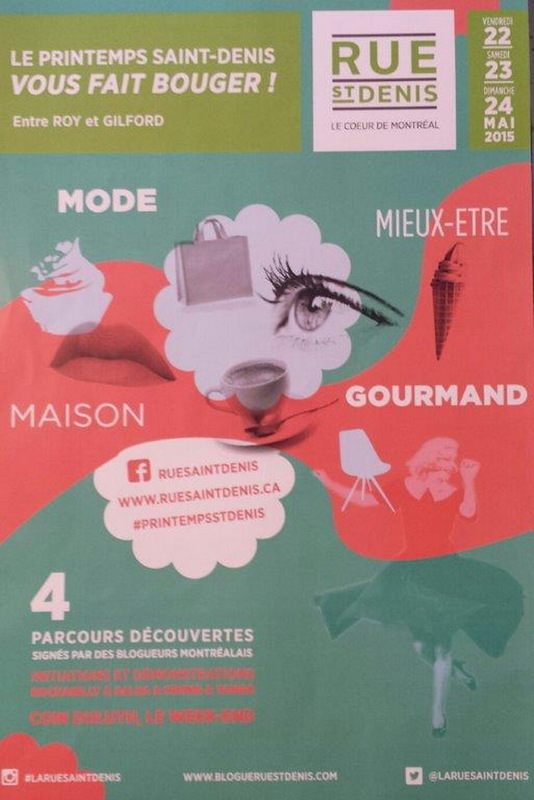 St. Denis Street will be bustling this weekend, and it is your opportunity to visit and explore during the 4th edition of “Primptemps St. Denis” in the heart of the city. It is a great opportunity to rediscover the places and creators which make the charm of Saint-Denis so appealing, while enjoying offers and special events. In addition, dancing will be featured over the weekend at the intersection of Duluth & St. Denis and there will be initiations and demonstrations of Rockabilly, Salsa, Swing and Tango. There is sure to be a festive and fun atmosphere! 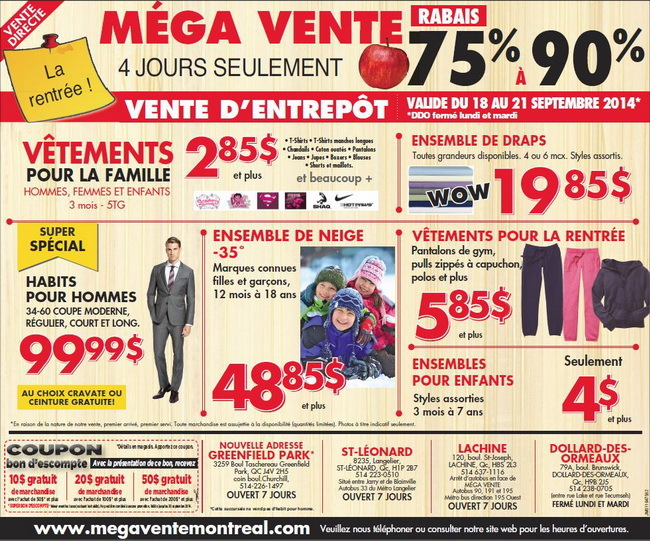 Mega Vente d’Entrepot is a warehouse with prices are hard to beat, and there is almost always something for everyone there at prices that are generally 75%-90% off. They must be doing something great, as they have opened their 4th warehouse on the South Shore in Greenfield Park. Prices for family clothing start at $2.85. For school gym pants, hoodies, polos are $5.85 and up and snowsuits (12 mos – size 18) $48.85 and up. Children’s outfits (3 mos-size 7) $4 and up. There’s a coupon below. If you spend $50, you get an additional $10 off, spend $100 and its $20 or spend $200 and it’s an amazing $50 off. They have 4 warehouses so no matter where you are in the city, you are close to their deals. M.H. Grover has always been the go-to place for big and tall guys in Montreal. 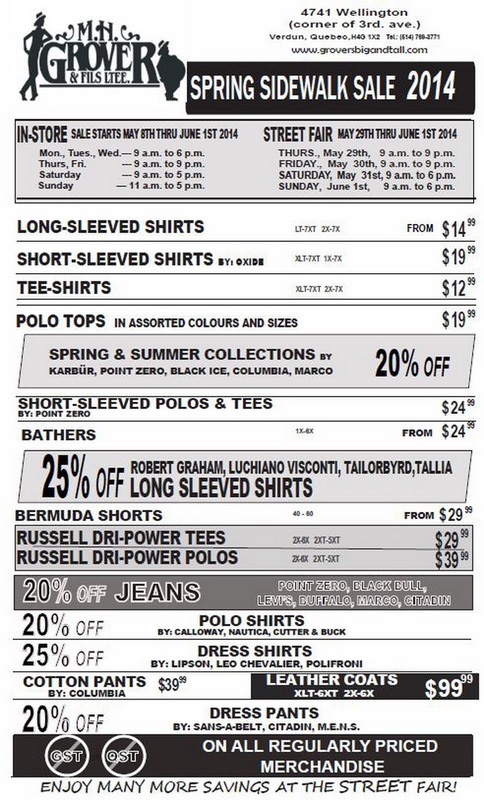 Their in-store sale has started and will go until June 1. 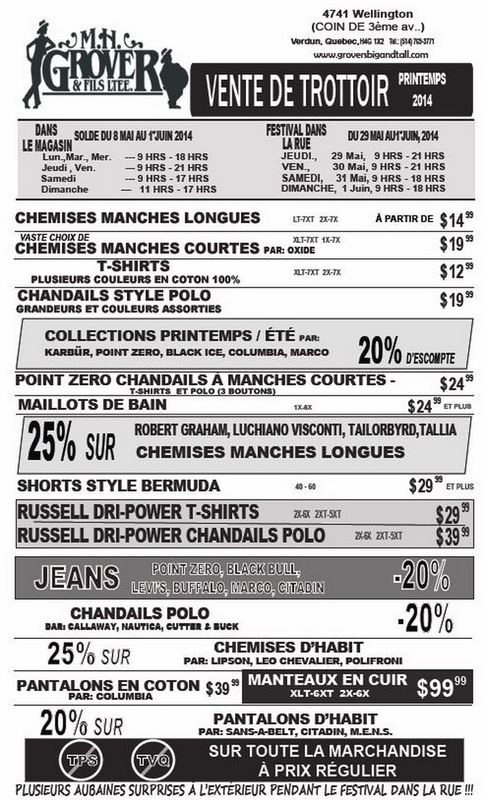 Wellington Street in Verdun where they are located, will be having a Street Fair on May 29 thru June 1 so expect even better deals then. No taxes on all regularly priced merchandise. Q: Hi Sandra, we are going to a wedding in Europe. Any ideas on where to get a Canadiana gift? Thanks so much, your book and site are my standbys for info! A: Everything possible Canadian can be bought in shops on St-Paul Street in Old Montreal. Start at Place Jacques Cartier and walk west. There are many shops there, some artisan run, some souvenir-y. More unique items are in the shops inside Marche Bonsecours, east of the Place. You can also buy aboriginal art at Galerie Le Chariot, 446 Place Jacques Cartier or Indianica on St-Paul. Good ideas for Holiday gifts. And don’t forget the Hudson’s Bay blankets, etc. sold at La Baie. 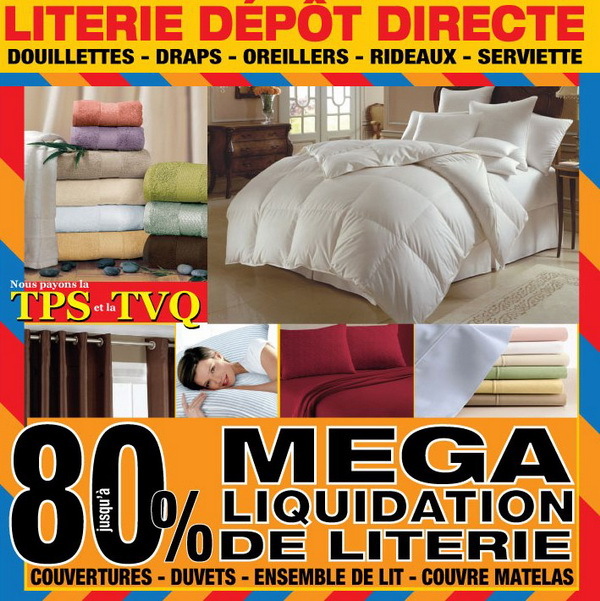 They are liquidating overstocked high quality, brand name items and the taxes are included in their already low prices. You can save up to 80% on a huge range of goods from mattresses and box springs by Maison Blanche, duvets, comforters, sheet sets and pillows to towels, curtains, blinds, decorative accessories and more. You won’t be disappointed with brand names like Quicksilver, Sandra Venditti, Liz Clairborne, U.S. Polo, Beverly Hills Polo and Maison Condelle. Linen Depot Direct even delivers mattresses and box springs right to your door. To celebrate Father’s Day, why not take your Dad over to Decarie boul. to feast your eyes on beautiful antique cars that will be on display between 11-4 on Saturday June 15. While there, treat him to some new duds at Jaf Pret A Porter. They will be holding a sidewalk sale with great deals on shirts, polos, pants, shorts. may of the items will be 10$ and 3 for 25$. Jaf is a family neighbourhood corner store which has carries men’s clothes, some with well known names – Robert Graham, Jack Victor, Baumler, Tombolini, Tommy Bahamas, m.e.n.s., Alberto, Victorinox, S. Cohen, Façonnable, Nautica. Helpful salesmen will find you pants (to 50) and shirts (to 2XL) starting at $10, suits (to 56) at $145 – $995, sports jackets $75 & up, sweaters, jackets. There are also made-to-measure suits and shirts, and suits for athletically built men. Expect free on the spot alterations (not in the liquidation center). Ask about tuxedos and rentals, and if you need them, boys’ suits in sizes 4-20. This whole weekend, Mont-Royal Ave from boul. St-Laurent to Iberville is shut down for a street fair. Boutiques are set up in the middle of the street selling off all kinds of goodies. Restaurants are cooking snack foods. At the western boul. St-Laurent end of things, there’s friperies, cool Montreal young designer boutiques and goth shops. After you cross St-Denis and head east there’s the strip of used record/CD stores. Q1: You wouldn’t think about it with today’s temperature, but with the Fall season around the corner, women are going to need to refresh their wardrobes. Yes if they shop at outlet stores or liquidation stores, they can get the brand names they know, that fit them well, for a lot less. Q2: What is the difference between an outlet store and a liquidation store? An outlet store is often a store where the same brand is sold for less but it may not be the same items as in their regular retail stores. Not all items sold at an outlet are found at their regular stores – perhaps the weight of the cotton is less or the logo is stenciled on instead of embroidered or it was bought just to be sold here. Some outlet shops mix these different items, some recalls from regular stores and some regular priced items. A liquidation store is clearances from the regular stores from last season or overstocks from this season. Q3: If they don’t have time to run all over the city for these, are they clustered anywhere? Centre Riocan in Kirkland is large, has 4 strips of shops around a parking lot and there are perhaps two dozen stores in this outdoor “mall”. If you keep going west on the TCan to Exit 26, you will bump into a teeny weeny strip of 4 shops at Promenades Hudson. Both of these have some “single” brand ladies upscale clothing. Q4: Okay we’ve made it to those malls, now, where to we shop? Liz Claiborne Outlet is about to close on October 13. Liz lovers will be thrilled to be able to buy some of her lines discounted here – Liz & Co, Liz Golf, Liz Clairborne in sizes 4-22. The store is a mix of regular products like you’d find in a regular-priced boutique and clothes made just for outlet stores. You need to know the difference – or ask. Jones New York Magasin Entrepot offers up Jones for less here in this white, airy spot. Beyond Jones (Sport, Signature Collection, Joneswear), though, you could buy Anne Klein New York, AK Sport, Evan Picone, Kasper, Bandalino or Nine West in a large size range from 2-16, 14W-24W and petites too. 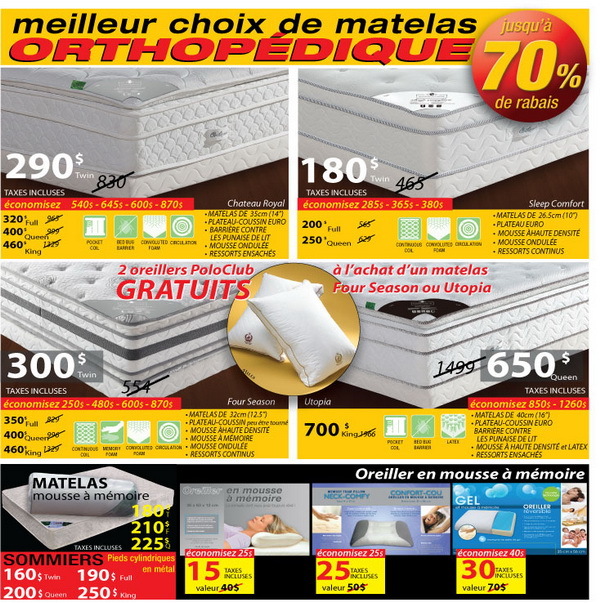 Other locations: Promenades Hudson (450-455-9009); St-Sauveur (450-227-8711). Q1: It’s time to be a tourist in our own city, can you tell us a bit about what’s happening in Old Montreal? When was the last time you went to Old Montreal? If you haven’t seen it in the last few years, you won’t recognize it. The software companies that marched into its western end, mostly west of McGill St., have turned this area on its nose. Now there are people living and working down here. Fabulous new restaurants have opened up in wonderful new boutique hotels. At the eastern end, near Bonsecours St., an entire new neighborhood was created. Q2: That sounds like a lot of changing, is the street scene modernizing and losing its Old World charm? Did you know that the buildings on de la Commune Street look exactly the same today as they would have been to a sailor who sailed into the port in the 19th century? Place Jacques Cartier has been totally refreshed. For the summer, St. Paul street has been turned into a pedestrian mall. Q3: Let’s get back to your specialty, what about the shopping there? For all of the new inhabitants, retail shops opened to feed and care for them – bakeries, dry cleaners, clothing shops, furriers and depanneurs have filled up the empty storefronts. At first glance, dear old St. Paul St. is still filled with so many souvenir shops. Having said that, a handful of them contain the works of real artisans or more upscale gifts, and those are worth stopping in to see. Q4: What kinds of thing would we find in those stores? L’empreinte Cooperative is a 37-year-old co-op for over 70 Quebec artists and artisans, you can expect to find variety, including ceramics, handmade albums, glass vases, bowls, sheepskin slippers, pewter lamps, handmade clothing, puppets and creative jewelry. Marianne Chevalier weaves pictures using copper thread and for souvenir hunters, Renee Bovet captures Montreal street scenes on silk. Smack in the middle of old Montreal, Les artisans du meuble quebecois, is a 43-year-old artisan’s consignment shop displays some of the wares of a minimum of 450 artists. Look for: glassware, ceramics, handmade cards, duck decoys, door knockers, fish bone shadow boxes, scarves, wooden kids’ furniture, dolls, quilts, creches, jewelry (silver, beaded), wooden boxes and then some. Hours: Daily 10 a.m. to 9 p.m.
At Tant qu’il y aura des fleurs, the decor here feels like you’ve stepped into someone’s lovely rustic home. Objects to fill yours include artificial fruit and veggies, candlesticks, large quilts and pillows, Joanel purses, animal wallets, woven place mats, colorful tablecloths from Provence (wash ‘n use, stain repellent), dishes, wooden bowls, vases, interesting jewelry and for fun, roosters, For babies, look in the back for little terry robes and booties made in Quebec. Everything can be gift-wrapped to go. Right now you’d be surprised but they have set up a Christmas section and does make people smile when the see it. Hours: Daily 10 a.m. to 7 p.m. Inside Marche Bonsecours, , emphasizes natural items. Look for framed displays of beetles or butterflies, petrified wood, some minerals and fossils. You can buy an 8′ giraffe, skin drums, stone candle holders, dream catchers, bamboo flutes, paper lanterns and some really nice handmade paper stationery. Hours: Monday to Saturday 10 a.m. to 9 p.m., Sunday 10 a.m. to 6 p.m.